As Michael Bay and director Dave Green continue filming Teenage Mutant Ninja Turtles 2, we’ve been getting our first looks at the half-shelled action to come. We’ve already seen Megan Fox go all Britney Spears for the sequel, but now our first official look at one of the new characters has arrived. 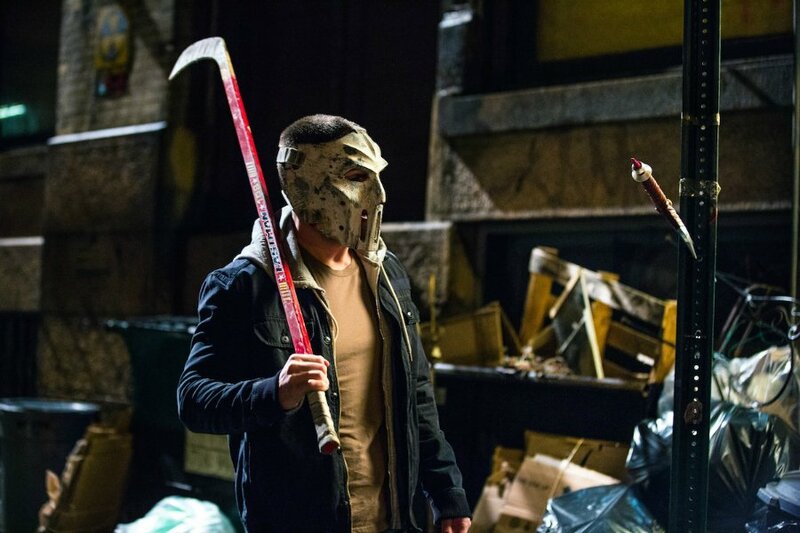 Meet Arrow star Stephen Amell as comic book character Casey Jones. Bay released the first official image of Stephen Amell suited up and equipped with a Friday the 13th-style hockey mask and hockey stick, as if he’s ready to go out a’ Purging. The character was first created to be a parody of vigilantes, wielding all sorts of weapons, like golf clubs, and baseball and cricket bats. He sees kindred spirits in the Turtles, since all of them like to take the law into their own hands. Jones typically falls in line with such names as Daredevil and, yes, Green Arrow, so this should be an easy-as-pie role for Stephen Amell to pick up. However, the actor wanted to assure fans that the Jones is a fundamentally different character than what he plays on The CW. However, during a Q&A at Fan Expo Vancouver 2015, he teased that Jones "is almost like the Oliver Queen people know from the older comic books." For those unfamiliar with the character, Casey Jones lost his parents at a young age to members of the Purple Dragon, and the encounter made him grow up to be the harsh and violent figure he is today. In the photo above, note the dagger sticking out of the sign post. It seems like a reference to Raphael, a character who has a close relationship with Jones in the comics. In the issue "Me, Myself and I," Jones actually grapples with the red-masked Turtle a bit after he is found beating the life out of a few muggers. They eventually reconcile, and Jones comes to help the half-shell heroes in fighting Shredder. More importantly for Megan Fox, Casey Jones is a love interest for April O’Neil. Variety reported back in March that Amell auditioned with dozens of actors for the role, but that it was ultimately his chemistry with Fox that sealed the deal. Not too much is known about the plot of TMNT 2, though paparazzi photos of the set reveal Jones encountering O’Neil as she is running across the street carrying a vile of purple ooze. Elsewhere, Oscar-nominated actress Laura Linney recently joined the cast in an unknown role, while Brian Tee is our new Shredder. Teenage Mutant Ninja Turtles 2 will open in theaters on June 3, 2016.